We finally went to a hummingbird festival after years of just saying we were going to go. My wife, Sandy, and I attended a session at a farm south of Jacksonville. 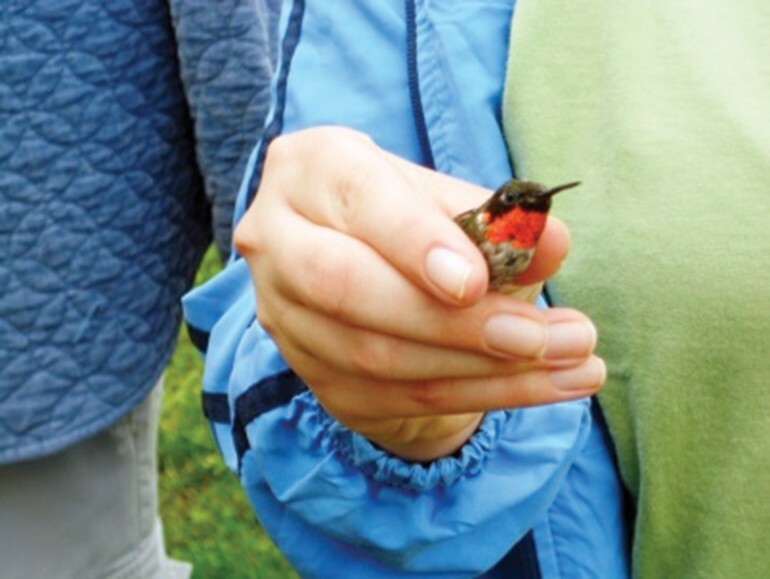 The host family had 15-20 bird feeders that attracted 20 – 30 hummingbirds. The event was free. There was, however, an optional charge of $5 if you wanted to “adopt” a banded bird. We took two; they’re small. A bird authority gave a brief talk and answered questions about the birds and the banding procedure. After the presentation, the farm hosts removed most of the feeders and put them in a shed. The only hanging feeders remaining were inside large cages. The birds would fly into the cages to feed and couldn’t get out. When the hummers finally sat down to rest, a host would reach in the cage, gently grab the bird and place it in a small cloth draw-string bag. The bag was taken the person doing the banding and he removed the bird from the bag. A teenie-tiny coded band was placed on the teenie-tiny bird’s leg and the number recorded in a ledger with the bird’s measurements. The bird was handed to an assistant who placed the hummer on the hands of the person who paid for the band. The bird would fly away when it was ready. Sandy’s bird sat on her hands for a number of minutes; my bird was nervous and flew-the-coop as soon as it hit my hands. Sandy’s bird was a first time band but my bird already had a band. The hosts looked in a ledger and found that my bird had been banded in 2011 at the same farm. When banded birds are again caught, the person who purchased the band is notified where and when their bird was captured. One of the many interesting facts we learned was that hummers are attracted to the color red …. but … birds should not be fed the red food coloring that is available in stores. The food color is not easily processed by the bird’s digestive system and shortens the life span. Nectar for feeders can be made at home using 1 part sugar and four parts water. Small batches should be prepared and the feeder should be cleaned every 3 -4 days for optimal attraction. If you have an interest in these fascinating birds, the festivals are nearing the conclusion for this season but there are still opportunities. To see a schedule of events go to the following web site: http://www.hummingbirds.net/events.html. A hummingbird festival is held annually in Jacksonville, the small bird is held by an assistant who placed a band on the bird.